Olympia, WA – Washington can’t meet its greenhouse gas reduction goals unless we reduce emissions from buildings. That was the message delivered today to the Washington Senate Environment, Energy, & Technology committee by businesses and environmental and clean energy advocates who are calling for the passage of Senate Bill 5293 and its companion House Bill 1257, the Clean Buildings Act. 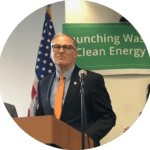 In making the Clean Buildings Act part of Governor Jay Inslee’s climate change package, the governor’s office points out that buildings – houses, stores, offices, and others – are responsible for more than a quarter of the state’s greenhouse gas emissions and 70% of those that come from the electricity sector. And they’re those emissions are increasing – up 50% since 1990. The Clean Buildings Act addresses that challenge by establishing energy efficiency standards for large commercial buildings and provides incentives for building owners to meet the new standards accelerate achievement. . It also empowers local governments to voluntarily adopt more efficient energy codes (stretch codes) that exceed the state’s minimum standards for houses and small residential buildings. And it creates conservation performance standards for natural gas companies and encourages them to replace natural gas from fossil fuels with renewable natural gas from farms and landfills. Wheeless also pointed out that energy efficiency is big business employing more than 60,000 Washingtonians in fields like design, construction, HVAC, manufacturing, lighting, and appliance sales.